Here is my awesome and wonderful Moleskine folio from Rickshaw Bagworks!! This is one of the goodies I bought myself for Christmas, along with my fantastic Mini Zero Bag which I will tell you all about in a future post. From Rickshaw's huge selection of fabrics and colors I chose the purple faux suede fabric (which comes in several colors), because I like fuzzy-feeling fabric and (as we all know) I love purple. I chose the pink edge binder for contrast, but you can choose whatever color you want for the edge binder. Rickshaw has an astounding selection of fabrics and colors. They have super-tough waterproof fabrics, fabrics made from recycled plastic bottles, solids, patterns, even tweed. They will custom-make your folio using any of the fabrics they have. Or, if you have a fabric you love, contact them because you can send it to them (ask them for dimensions) and they will cover your folio with it. Take a look at their video explaining more about the fabric possibilities. 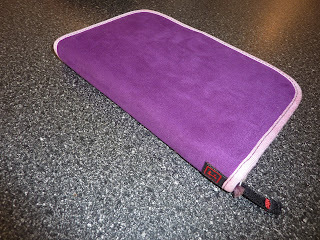 Each cover is custom made to order to your specifications! The Rickshaw folios are specifically sized for the Large Moleskines, which are 8 1/4 inches tall by 5 1/8 inches wide. My folio is the Original, which holds a large Moleskine notebook, sketchbook, weekly planner, or 18 month weekly notebook (which is what I have in my folio). Recently they came out with an additional version that accommodates the thicker Moleskine Daily Planner, and also a version with a pocket for your smartphone or other electronic device! Just specify which version you need in the comments at checkout. Here is the inside of my folio. This thing is genius. It holds my pens inside the front cover (Those are Sakura Microns for you pen geeks out there). The pen pockets are generously sized to accommodate G2s. Also inside the front cover there is a zip pocket to hold money, your passport, stamps or whatever else. 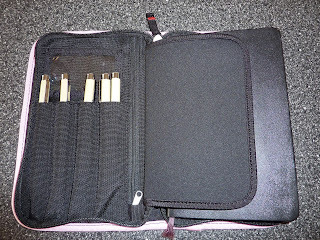 Just above the pen pockets there is a clear window for your ID. There is a padded flap between your pens and your Moleskine's cover, so the pens don't dent or scratch the cover of your book. I took my Mole out so you could see the details of the inside of the back cover of the folio. The back cover of the Mole slides into the fitted slot to hold the book securely inside the folio. There is a clear pocket to hold papers or whatever else, allowing you to see what's in there. Then when you are finished with your book, you can archive those items inside the Moleskine's back pocket. Another really fun video to watch is Mark at Macworld, telling us how he's using his folio. It's a great view of the folio in action. 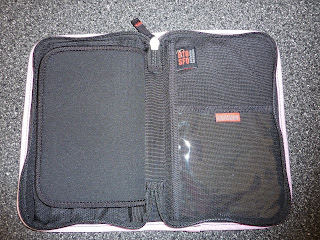 The only thing that I would change about the folio, if I could, is to have the zippers zip closed in the up position. The way the folio is configured, the inside pocket zipper and the exterior zipper both zip closed in the down position. It would work better for me if the inside pocket zipped closed up so that my coins and small things don't spill out the bottom when I unzip. 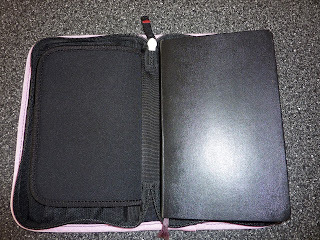 More importantly, I would love it if the external zip-around would zip closed in the up position, so that when I put airline tickets, long envelopes or tall papers into the back pocket I could zip the bottom and side closed and leave the top unzipped to let them stick out the top of the folio . To change the zippers like this would require a reconfiguration of the folio design. 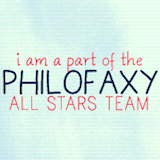 Maybe something to consider for future incarnations of the folio? **Edited to add: see Mark's reply in the comments. He designed the external zipper to zip down so it doesn't catch on the ribbon placemarker. He's really thought this through, obviously! Rickshaw Bagworks is a very cool company in San Francisco that is very socially aware and does tons of great work locally. They custom-make messenger bags, commuter bags, baby bags, bike accessories, these great folios, and more. They also really listen to their customers and respond to their needs. I really respect them as a company. You're awesome, Rickshaw! So if you use any kind of large Moleskine notebook or planner, check out their folios. They are a great way to personalize your book and carry your pens and other things with you everywhere you go. I love that it can be all-in-one: you have your Mole, your pens, your cards and money (and even your passport!) all held securely in its zip-around goodness. Grab your folio and you're ready to go to work, on your long weekend, or trekking in the Himalayas. Huge WIN! Thank you Rickshaw! Mark tried to comment on this post but Blogger gave him a hard time, so he emailed it to me and I told him I'd post his comment on his behalf. Thanks for the comment Mark! Now I get it re: the zipper configuration! He has obviously thought this design through. Have a great final day of your long ride, and enjoy the TED conference! I like their products Laurie, very clever designs. Looking forward to your review of the Mini Zoom bag... I'm a bag geek I suppose! As an alternative a double zipper that allows a user to make a choice about whether to zip up, down or have the two meet in the middle could be the best of both worlds.